Standard Bunk: $725.00 per person; includes all meals. 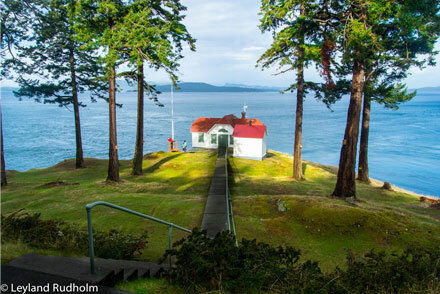 Join us for an enchanting sailing adventure aboard the Schooner Zodiac as we circumnavigate the remote lighthouses of the San Juan Islands. 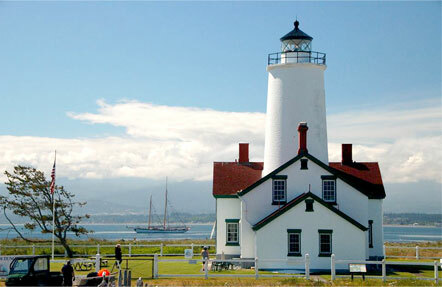 Shore parties will visit selected light stations with knowledgeable tour leaders. Come aboard with the crew of the Schooner Zodiac for four slow-paced, magical days in the San Juan Islands, seeking wind to fill the sails and quiet coves to drop anchor each night. Learn how sailors returning from sea relied on lighthouses to determine position at night or in the fog or stormy weather. Before the advent of Radar and GPS, position was determined by matching information on the charts with lights at specified positions, with identifying gongs and horns. Answer the call of the wind and water, and the ringing commands from the quarterdeck: “sailing stations”, “all hands on deck”, “prepare to come about”! Each passenger sailor learns their assigned sailing station, and stands a watch rotating from charts (navigation) to helm, bow watch and quarterdeck messenger. Part of the adventure of sailing is that wind and tide may alter your course. For this reason the Zodiac may deviate from it’s intended route at the captain’s discretion. Bearing this in mind, the captain and crew will always endeavor to give passengers the most incredible experience possible. Already booked and wondering what to pack? See our handy packing list.